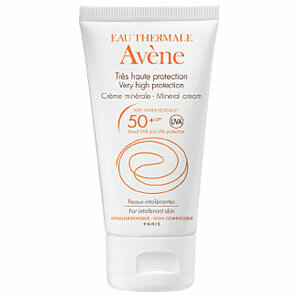 Protect your skin with the gentle Avene Very High Protection Mineral Cream SPF 50+, a nourishing facial sunscreen. Especially formulated for the sensitive skin of both adults and children, the cream is ideal for those who are intolerant to chemical sunscreens and fragrance. A complex of mineral filters shield the skin from UVA and UVB rays, and are stable and effective for extended periods of time.